Fabtron's Easy Rider Trail saddle provides a refreshingly balanced ride with its solid brass dropped C rigging on a specially designed all-around saddle tree. The extra-durable, top-quality leather and Cordura combination delivers a traditional leather look at half the price. The solid brass bleed-thru conchos and rigging dees highlight the clamshell tooling on a unique, two-piece jockey and close-fit trimmed skirt. The Ralide saddle tree with full quarter horse bars fits most horses. The specially designed gullet saddle tree is seven inches higher and wider, with a little extra front-to-back twist on the bars and a little flare on the ends to allow easier movement. Take your ride to a whole new level of quality, design, fit, and riding comfort! 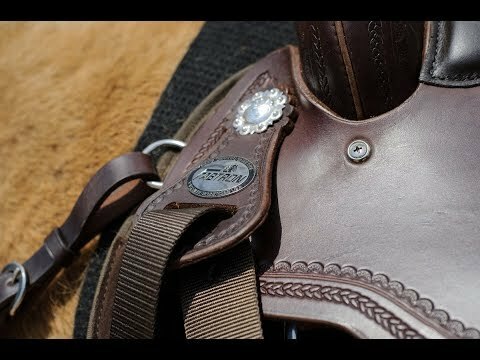 I have three Fabtron saddles and this one is my favorite. It fits me the best. I think it has a very balanced ride and my horse seems to like it too. I like the lighter weight as I can't lift the heavy saddles anymore.I love the look of the saddle also, the leather is a nice quality, the cordura is sturdy. I bought it used, it still looks new and I've owned it for a year. I also love that they are made in the USA. I am in my 60's now and could not lift my Fallis Balanced Ride any more, this saddle is just as comfortable as it and has a balanced ride pretty much like the Fallis and it is a lot lighter. Very happy with my purchase. I have only been using this saddle about 2 weeks. It is extremely comfortable. I am 59 and was looking for something light weight. This matches that criteria perfect. My leather saddle is about 45 pounds so this is much easier for me. Fits my 15 H quarter horse great. it came with a nylon cinch, which I am not fond of so I am using my leather one instead. i am very pleased with my purchase! This saddle is nice for leather/cordura. It has decent finishings. I was a little surprised that the leather under the pommel was just stapled together. I am used to seeing brass or stainless rivets there. There are many nice things about this saddle. It is very light weight. It looks high end for a leather/cordura, even compared to the Big Horns. The look is nice, the brass rigging is pretty. The leather is a nice color, and is decent qualtiy. The cordura seems like it would hold up well. I had this saddle for about 4 months. For me this was not a good saddle. I found this saddle to be uncomfortable for me. It never sored my horse. The balance of the seat is kind of strange, I felt like it was throwing me back onto the cantle even though the seat felt big. The sweat marks under my saddle pad were always concentrated under the cantle area. The seat is large for a 16", maybe feels half a size large. I hated the sueded/rough out seat. I know many people love them though, that is a personal preference thing. To be fair, I also tried another big name leather/cordura saddle and was equally disappointed, so it is likely I simply prefer well made all leather saddles. Love this saddle. I did replace girth to a leather one. Also replaced stirrups. They were plastic. Very comfortable saddle. I am 60 years old and needed something light weight. What is the gullet height on this saddle? BEST ANSWER: The specially-designed, 7" higher and wider gullet saddle tree has a little extra front-to-back twist on the bars and a little flare on the ends to allow easier movement. Will this fit a horse with withers - not a straight back, needs room for free movement of shoulder? BEST ANSWER: My horse is very broad in shoulders with high withers. It fits him very comfortably. I love the saddle. Hi Susan - He definitely does not have a straight back, there is a dip behind the withers. He has a pocket behind the shoulder blade. I would not say he has broad shoulders. His shoulders can't fully move back and forth with current saddle. Cantle is high so it should fit with plenty of either clearance. . Just make sure you have adequate padding if he has some dips . That's my opinion. If your horse cant move shoulder saddle is way too small for him& causing discomfort.